Modern emergency health service systems are complex entities that require the coordination of multiple service organizations in order to be effective. The common goal of this cooperative effort is to reduce death and disability resulting from acute illness and injury. The emergency health care system is the larger health care system’s method of reaching out to people experiencing unforeseen medical emergencies, assessing their needs, initiating care, and transporting them to an appropriate facility while continuing care. Emergency health care encompasses agencies ranging from local rescue squads to national and international disaster and refugee health services, and includes mobile (i.e. ambulances) and fixed resources (hospitals). Increasingly, EHS agencies are becoming more involved in activities aimed at the prevention of injuries and sudden illness, and are exploring other public health roles. In order for this work to be effective, a high degree of management capability, combined with targeted research and education are required. Our Master’s and Ph.D. Concentration programs are designed to address these needs. The UMBC Emergency Health Services graduate study programs encompass the system components listed above. The program is primarily focused on preparing professionals for leadership roles requiring skill in planning, research, development, and organizational operations. The curriculum is designed to provide graduate level training and education to health care providers, researchers, educators, policy makers and administrators. Regular admission criteria for the Graduate School are required for all prospective degree-seeking Emergency Health Services graduate students. Those wishing to “test the waters” or to enroll in one or two courses without degree candidacy may register as Non-Degree Students. Consult with a departmental advisor for more information. Applications are available through the graduate school. You must have an undergraduate grade point average (GPA) of at least a 3.2 out of a 4.0 scale for acceptance into the Emergency Health Services program, otherwise, you will be required to take the Graduate Record Examination (GRE). Completion of another post-graduate degree with a GPA of at least 3.0 is an acceptable substitute. Applicants for whom English is not a native language must have a score of at least 550 on the written Test of English as a Foreign Language (TOEFL), or 80 on the internet-based test (iBT) version, or minimum of 6.5 on the International English Testing Language System (IETLS). Consult the UMBC Graduate School Catalogue for further requirements and deadlines. The EHS baccalaureate program began in 1980. Our goal was to produce the most comprehensively educated individuals capable of performing tasks within the broad scope of the emergency health care field as leaders, managers and providers. Our graduate program, the first in the nation for EHS, began a year later. It remains the largest program of its type available in the United States. Our program is unique in its proximity and interaction with other world-renown emergency medicine resources. We share faculty, resources, and projects with the R Adams Cowley Shock Trauma Center, the Maryland Institute for Emergency Medical Services Systems (our state EMS agency), the University of Maryland School of Medicine’s Department of Emergency Medicine, and its National Study Center for Trauma and EMS. Many students intern in these organizations. Our proximity to Washington D.C. enhances access to national agencies such as the Federal Emergency Management Agency, the Department of Homeland Security, the National Highway Traffic Safety Administration, and the Department of Health and Human Services. 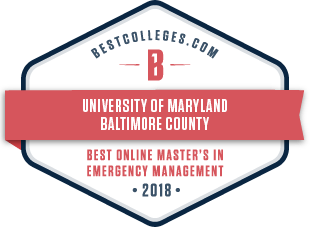 Maryland is often looked to as a leader in emergency medical services; our Graduate Program is one of the resources enhancing this reputation. 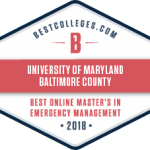 In 2018, the Emergency Health Service Graduate program was ranked as #7 in the top 10 Best Online Master’s Programs for Emergency Management.